To reduce the burden of cardiovascular disease (CVD), management strategies are increasingly focusing on preventive measures following early detection of markers of atherosclerosis. This review focuses on microalbuminuria, which is gaining recognition as a simple marker of an atherogenic milieu. Prospective and epidemiologic studies have found that microalbuminuria is predictive, independently of traditional risk factors, of all-cause and cardiovascular mortality and CVD events within groups of patients with diabetes or hypertension, and in the general population. The pathophysiologic mechanism underlying the association between albumin excretion and CVD is not fully defined. One hypothesis is that microalbuminuria may be a marker of CVD risk because it reflects subclinical vascular damage in the kidneys and other vascular beds. It may also signify systemic endothelial dysfunction that predisposes to future cardiovascular events. Based on this theory, periodic screening for microalbuminuria could allow early identification of vascular disease and help stratify overall cardiovascular risk, especially in patients with risk factors such as hypertension or diabetes. A positive test for urinary albumin excretion could signify the need for an intensive multifactorial intervention strategy, including behavior modification and targeted pharmacotherapy, aimed at preventing further renal deterioration and improving the overall CVD risk factor profile. Data from intervention studies suggest that treatment with angiotensin-converting enzyme inhibitors or angiotensin II receptor blockers, statins, and/or strict glycemic control (in diabetics) offer significant reductions in cardiovascular and/or renal morbidity in patients with albuminuria. Use of this (old) marker may allow improved use of medications and strategies for secondary prevention. Statistics for the United States indicate that 71.3 million people in 2003 had some form of cardiovascular disease (CVD), that 13.2 million had coronary artery disease (CAD), and that CVD was responsible for 37.3% (910,614) of all deaths (1). This contribution of CVD to morbidity and mortality has directed attention to early atherosclerosis detection coupled with appropriate preventive intervention. Several atherosclerotic risk factors have been identified and have shown utility in predicting CVD. This review focuses on microalbuminuria, which is gaining recognition as a marker of an atherogenic milieu, owing to its association with several atherosclerotic risk factors and early systemic vascular (endothelial) damage (2). Microalbuminuria is a persistent, increased urinary excretion of albumin (Table 1 shows diagnostic thresholds) (3–5). Data from the 1999 to 2000 National Health and Nutrition Examination Survey (NHANES) indicated that 8.8% of US adults had microalbuminuria (6). Older age, female gender, and non-Hispanic black ethnicity were associated with a higher prevalence (6). Population surveys also demonstrate an excess of microalbuminuria among individuals with diabetes and hypertension, the prevalence increasing with disease duration (6,7). In NHANES III (conducted 1988 to 1994), 28.8% of participants with diabetes and 16.0% with hypertension had microalbuminuria versus 5.1% of the subpopulation with no risk factors (7). Recent investigations demonstrate a continuous positive relationship between urinary albumin excretion (UAE) and adverse clinical outcomes (Figure 1) (8). Epidemiologic and experimental data show that microalbuminuria is associated with an increased risk for all-cause and cardiovascular mortality, cardiac abnormalities, cerebrovascular disease, and, possibly, peripheral arterial disease (PAD) (Table 2). The association between UAE and adverse clinical outcomes is observed at levels below the current microalbuminuria threshold (8–10). For example, in a 6-yr examination of 1568 seemingly healthy individuals (without hypertension, diabetes, or CVD), the risk for cardiovascular events increased continuously with the level of UAE not only in the whole study population but also in the subgroup of patients with albuminuria below the threshold for a definition of microalbuminuria (10). Cardiovascular outcomes in the Heart Outcomes Prevention Evaluation (HOPE) by degree of albuminuria. 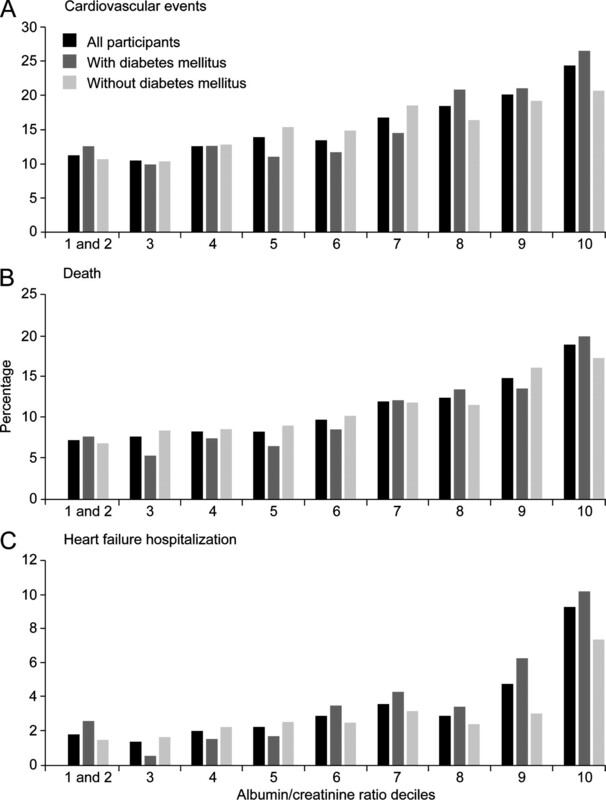 (A through C) Major cardiovascular events (myocardial infarction, stroke, or cardiovascular death; (A), all-cause mortality (B), and hospitalization for congestive heart failure (C) in each albumin-to-creatinine ratio decile for all participants, participants with diabetes, and participants without diabetes. Deciles 1 and 2 are combined because of very low incidence rates in these two deciles. Decile 8 includes an albumin-to-creatinine ratio decile of 2 mg/mmol, the microalbuminuria threshold. Reproduced from reference (8), with permission. The correlation between microalbuminuria and mortality was apparent from studies that involved high-risk patients (11). In a Heart Outcomes Prevention Evaluation (HOPE) substudy, UAE predicted mortality in patients who were at high cardiovascular risk (≥55 yr of age with CVD or diabetes plus at least one other cardiovascular risk factor) (8). All-cause mortality was 9.4% among patients without microalbuminuria versus 18.2% among those with microalbuminuria (relative risk [RR] 2.09; 95% confidence interval [CI] 1.84 to 2.38). A linear relationship was also observed between the microalbuminuria level and cardiovascular events, extending below the traditional microalbuminuria threshold. In a prospective study that involved individuals who were aged 50 to 75 yr, microalbuminuria was associated with an increased risk for cardiovascular death after adjustment for other risk factors (RR 3.22; 95% CI 1.28 to 8.06; Figure 2) (12). The risk for all-cause mortality in patients with microalbuminuria was also elevated (RR 1.70; 95% CI 0.86 to 3.34), especially among those with concomitant hypertension (RR 2.87; 95% CI 1.22 to 6.33). Cardiovascular survival (Kaplan-Meier) according to microalbuminuria status in a population-based cohort aged 50 to 70 yr. Reproduced from reference (12), with permission. The presence of microalbuminuria also seems to predict all-cause mortality in the general population (9,13–15). This was initially shown in the Prevention of Renal and Vascular Endstage Disease (PREVEND) study, in which inhabitants of Groningen, The Netherlands, who were aged 28 to 75 yr were sent a questionnaire and a vial to collect an early-morning urine sample for measurement of UAE (9). A total of 40,548 participants who were followed for 2.6 yr were included in an analysis of mortality by baseline UAE. A clear positive relationship was observed between UAE and all-cause, cardiovascular, and noncardiovascular death. A two-fold increase in UAE was associated with a 1.29 (95% CI 1.18 to 1.40) higher RR for cardiovascular death and a 1.12 (95% CI 1.04 to 1.21) higher RR for noncardiovascular death. Importantly, the relationship was apparent at levels of albuminuria that are considered normal. Microalbuminuria seems to correlate with various cardiac abnormalities and diseases, including left ventricular (LV) dysfunction and hypertrophy, electrocardiographic abnormalities, and ischemic heart disease (IHD) (16). The Strong Heart Study demonstrated a significant association between microalbuminuria and echocardiographic parameters of LV systolic and diastolic function in a cohort of 1576 Native Americans with diabetes (17). Furthermore, a correlation has been noted between UAE and echocardiographic measures of LV mass index, LV hypertrophy, and concentric hypertrophy in untreated hypertensive patients (18). The larger Losartan Intervention For Endpoint reduction in hypertension (LIFE) study confirmed this finding (19). A study that involved 64 asymptomatic patients with type 1 diabetes revealed a higher incidence of myocardial ischemia, detected by stress echocardiography and electrocardiography, in the presence of microalbuminuria versus normoalbuminuria (25 versus 6.3%; OR 6.3; 95% CI 1.2 to 37.8; P = 0.03) (20). Electrocardiographic recordings from 7579 PREVEND participants without diabetes showed an independent association between microalbuminuria and infarct patterns (odds ratio [OR] 1.61; 95% CI 1.12 to 2.32), major ischemia (OR 1.43; 95% CI 1.08 to 1.91), and minor ischemia (OR 1.32; 95% CI 1.03 to 1.68) (21). This group subsequently reported that, in patients with electrocardiographic ST-T segment changes, microalbuminuria could identify those who were at increased risk for all-cause and cardiovascular mortality (22). Microalbuminuria was also associated with a 2.3-fold (95% CI 1.3 to 3.9) higher RR of IHD in a population-based study of 2085 individuals without previous IHD, renal disease, or diabetes (23). Survival free from IHD during follow-up was 97% among patients with normoalbuminuria versus 91% among those with microalbuminuria (P < 0.0001). It is interesting that the IHD risk that was associated with other conventional CVD factors more than doubled in the presence of microalbuminuria (23). Elevated UAE also correlates directly with angiographic evidence of CAD. A study of 308 patients who underwent elective coronary angiography revealed that patients with angiographic evidence of CAD had significantly higher urinary albumin levels than disease-free individuals (28 versus 10 mg/g; P < 0.001) and that UAE increased progressively with CAD severity (24). Microalbuminuria is common among patients with cerebrovascular disease and correlates with an increased stroke risk even after correction for confounding clinical risk factors. In the European Prospective Investigation into Cancer in Norfolk population, microalbuminuria was independently associated with a 50% increased risk for stroke (hazard ratio [HR] 1.49; 95% CI 1.13 to 2.14); the association with macroalbuminuria was even greater (HR 2.43; 95% CI 1.11 to 6.26) (25). In addition, a 15.5-yr cohort study that examined stroke risk factors in Japan showed that urinary albumin was an independent risk factor for stroke in men (RR 2.5; 95% CI 1.1 to 5.7) but not in women (26). An association between microalbuminuria and recurrent stroke has also been reported. Among a population of older (median age 65 yr) Americans with previous ischemic stroke or transient ischemic attack, microalbuminuria independently predicted future stroke (HR 4.9; 95% CI 1.4 to 17.6; P < 0.01 versus patients with normoalbuminuria) (27). Other reported cerebrovascular clinical correlates with microalbuminuria include cerebral ischemic lacunae, middle cerebral artery stenosis, impaired carotid arterial blood flow and vasomotor reactivity on Doppler ultrasonography, and increased carotid artery intima-media thickness. In addition, patients who have had an acute stroke and have microalbuminuria have a poorer outcome than those without microalbuminuria (28). Studies to explore the risk for PAD in patients with microalbuminuria are limited, and additional investigations are warranted to clarify the relationship. In PREVEND, the presence of microalbuminuria increased the risk for PAD in an unadjusted model (OR 1.51; 95% CI 1.09 to 2.10) but not in multivariate analysis (OR 0.98; 95% CI 0.68 to 1.41) (29). A second study reported a significant association between UAE and PAD among patients with type 2 diabetes (OR 2.1; 95% CI 1.4 to 3.2; P < 0.01) but not those with type 1 diabetes (30). The pathophysiologic processes that link microalbuminuria and CVD are unclear. Microalbuminuria could be a cause or a consequence of vascular disease. In the STENO hypothesis put forward by Deckert et al. (31), albumin leakage into the urine is a reflection of widespread vascular damage. In a sense, the kidney is the window of the vasculature. In view of these considerations, endothelial function and chronic inflammation have been suggested as possible candidates to explain the association between microalbuminuria and CVD (32,33). However, there are many inconsistencies in the literature. It is true that low-grade inflammation can be both a cause and a consequence of endothelial dysfunction, and some studies used markers of inflammation such as C-reactive protein, IL-6, and TNF-α, which indicate that low-grade inflammation is associated with the occurrence and the progression of microalbuminuria and with an associated increased risk for atherosclerotic disease (34–36). However, other studies indicate that although microalbuminuria, endothelial dysfunction, and low-grade inflammation are linked, they all are independently associated with risk for cardiovascular death (37,38). The inconsistency of these observations may reflect, in part, inadequate precision of the measurements of endothelial function and inflammation, or these markers may not be relevant to CVD risk in people with microalbuminuria. Although many cross-sectional and a few prospective studies indicated that microalbuminuria is associated with several cardiovascular risk factors such as aging, male gender, hypertension, diabetes, smoking, obesity, and dyslipidemia, it is clear that these explain, at most, a very small part of the association between microalbuminuria and atherosclerotic events. As with measures of endothelial function and inflammation, it is possible that this is related to inadequate quantification of these exposures, or there could be confounding by other risk factors that might cause both the microalbuminuria and the associated CVD. Another interesting theory is that some individuals are born with varying degrees of vascular function within a physiologic range and, therefore, excrete a variable amount of microalbumin (39). This inherent variability of the vascular state as determined by urine microalbumin excretion may be associated with susceptibility to subsequent organ damage (39). This could also explain why microalbuminuria is a predictor of not only CVD but also new-onset hypertension and diabetes (9). If this proves to be the case, then it may be desirable to identify these individuals to consider early interventional strategies to provide primary prevention. This hypothesis also raises the question about individualizing BP, cholesterol, and glucose goals in patients with microalbuminuria and associated increased susceptibility to organ damage. In a sense, the kidney may serve as a barometer of an appropriate BP goal; that is, the level of BP at which normalization of UAE occurs. Similarly, intensification of glycemic control and intensive reduction of LDL cholesterol if associated with normalization of UAE may represent a biomeasure of therapeutic success. Future clinical trials will need to address these considerations given what is known and not known about the relationship between microalbuminuria and CVD. 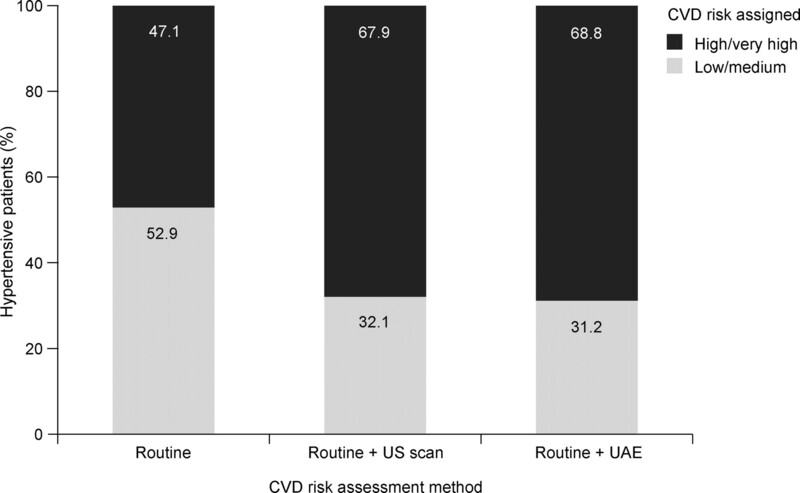 Because microalbuminuria precedes the appearance of hypertension and diabetes and independently predicts CVD risk (39), screening for UAE, a relatively simple process, should facilitate early vascular disease detection. Traditionally, a dipstick test has been used to measure protein in the urine. However, it is semiquantitative and insensitive, particularly when detecting albumin concentrations <300 mg/d. A variety of antibody-based methods are available to measure urinary albumin. These include RIA, nephelometry, immunoturbidimetry, and ELISA. A more modern HPLC method that is more sensitive to detect microalbuminuria has been developed (40). Whether this method helps to identify patients who are at increased risk for CVD compared with the traditional antibody-based methods is unknown. However, because there is a continuous relationship between the amount of UAE in the urine and cardiovascular events, it is likely that more sensitive measures may assist in the earlier identification of patients who are at risk. Preferably, an albumin-to-creatinine ratio that uses an overnight or first-morning void urine sample or measurement of albumin excretion per unit of time should be used for screening. With the latter method, a timed overnight urine collection avoids the complicating factors of a 24-h urine collection. For an untimed sample, the albumin-to-creatinine ratio is preferred but must be corrected for the gender difference in creatinine production between men and women (Table 1) (3). In addition, creatinine excretion in the urine depends not only on gender but also on age and race (41,42). The National Kidney Foundation guidelines recommend a front-end UAE screen in all patients who are at risk for renal disease, including those with diabetes, hypertension, family history of chronic kidney disease, age >60 yr, and racial and ethnic minorities (43). The American Diabetes Association (ADA) recommends an annual UAE test in all patients with type 1 diabetes of >5 yr duration and in all patients with type 2 diabetes starting at time of diagnosis as a prognostic indicator of CVD risk (44). UAE testing improves the accuracy of cardiovascular risk assessment in patients with hypertension (45,46). It also may be as reliable as an ultrasound evaluation of cardiac and carotid structure in predicting cardiovascular risk in hypertensive patients (45) (Figure 3), and combined ultrasound and microalbuminuria screening can improve the accuracy of target organ damage detection by 10-fold compared with routine investigation (46). Therefore, it seems reasonable to consider screening all patients who present with hypertension for UAE, as is recommended for patients with diabetes. Cardiovascular disease (CVD) risk stratification in patients with hypertension using routine diagnostic methods alone or coupled with either ultrasound (US) detection of left ventricular hypertrophy and/or carotid plaque or with urinary albumin excretion (UAE). UAE testing may also help to stratify risk in patients who are admitted for acute myocardial infarction and in directing acute and chronic care of patients with CAD. The presence of microalbuminuria during the first week of hospitalization for acute myocardial infarction is a strong prognostic marker for in-hospital mortality, particularly among patients with hypertension, and of long-term recurrent coronary events or mortality (47). Moreover, in the HOPE study, in a cohort of more than 9000 patients with substantial cardiovascular comorbidity or risk factors, there was a continuous relationship between urinary microalbumin excretion and cardiovascular events regardless of whether the patients had diabetes (8). This relationship extended well below the microalbuminuria threshold, emphasizing the continuous relationship between microalbuminuria and CVD events. Intensive and multifactorial interventions are recommended for patients with microalbuminuria to delay progression of CVD (Table 3). 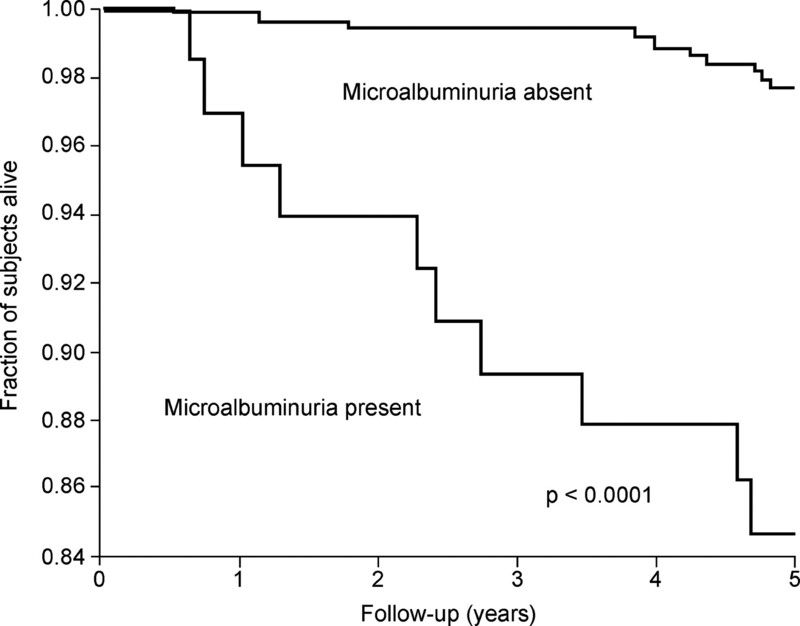 Despite the clear association of microalbuminuria with cardiovascular risk, limited studies have been performed to evaluate strategies to reduce microalbuminuria and evaluate the impact on cardiovascular events. The Prevention of REnal and Vascular ENdstage Disease Intervention Trial (PREVEND IT) is the only randomized trial to study the effect of albuminuria lowering in microalbuminuric, otherwise healthy individuals (48). In this clinical trial, the lowering of albuminuria with an angiotensin-converting enzyme (ACE) inhibitor only tended to be cardioprotective. One problem with this trial may have been an insufficient number of patients to be followed for a sufficient period of time to have enough events to evaluate the impact of treatment. A prespecified secondary analysis of the LIFE trial (patients with hypertension and LVH) noted that time-varying albuminuria was associated with cardiovascular events, suggesting that therapeutic strategies that are associated with a reduction of albuminuria may be cardioprotective (49). Smaller clinical trials in patients with microalbuminuria are illustrative of the advantage of ACE inhibition or angiotensin receptor blockade in limiting the progression from microalbuminuria to clinical proteinuria in patients with either type 1 or type 2 diabetes. However, whether limiting the progression from micro- to macroalbuminuria will result in fewer cardiovascular events is unknown. In clinical trials of patients with chronic kidney disease as a result of type 2 diabetes and clinical proteinuria, such as Irbesartan Diabetic Nephropathy Trial (IDNT) and Reduction of Endpoints in NIDDM with the Angiotensin II Antagonist Losartan (RENAAL) (50–52), it is evident that therapeutic strategies that are associated with reduction of proteinuria are associated with fewer cardiovascular and kidney disease end points (53,54). However, whether one can extrapolate these observations to microalbuminuric patients is unknown. Strategies to reduce microalbuminuria are available in clinical practice. Perhaps the most important is the reduction of BP. In the Irbesartan Microalbuminuria-2 trial, normalization of microalbuminuria in patients with type 2 diabetes and hypertension occurred in approximately 20% of patients who attained traditional BP goals of 140/90 mmHg with medications such as diuretics, β blockers, and vasodilators (50). An improvement of the normalization rate to approximately 33% occurred when the full dosage (300 mg) of the renin-angiotensin system blocking drug irbesartan (an angiotensin II receptor blocker) was used as part of the BP-lowering regimen to 140/90 mmHg. However, even lower BP goals may be advantageous for reducing UAE, and both the ADA and the Joint National Committee 7 recommend a lower BP goal of <130/80 mmHg in patients with diabetes (44,55). Higher dosage angiotensin receptor blocker or using both an ACE inhibitor and an angiotensin receptor blocker together in full dosage may facilitate an even greater reduction in microalbuminuria (56,57). Thiazide diuretics also help to reduce proteinuria (58), and dietary salt restriction may also be helpful in reducing UAE (59). Strict glycemic control also delays the onset of microalbuminuria, the progression of microalbuminuria to clinical proteinuria, and the development of nephropathy in patients with either type 1 or type 2 diabetes (5,44,60). Glycosaminoglycans have also been demonstrated to reduce albuminuria (61). Whether these specific therapeutic strategies will prevent progression of CVD because they reduce microalbuminuria is unknown. The Steno-2 trial demonstrated that intensified BP, cholesterol, and glycemic control in patients with type 2 diabetes was associated with decreased risk for cardiovascular events (62). However, this was not correlated with reduction in UAE. There is some debate in the literature as to whether statins reduce UAE (63–65). Regardless, these drugs are important given the CVD risk. Both the National Kidney Foundation and the ADA recommend an LDL cholesterol goal of <100 mg/dl for patients with advanced renal disease or diabetes (5,60). For patients with diabetes and CVD, an LDL goal of <70 mg/dl is appropriate. Disturbances in triglyceride, HDL, and non-HDL levels should also be addressed (5,60). Moreover, one needs to consider strategies to improve diet by reducing saturated and trans fats and dietary salt. In addition, efforts to assist in smoking avoidance, proper exercise, and weight control should be encouraged. Annual screening for UAE is recommended in people with diabetes (66). In part, this recommendation is based on the evidence that long-term cost-effectiveness is more favorable when treatment is started earlier in preventing ESRD (67), but there are no data when it comes to preventing CVD. The evidence for screening the general population without diabetes for UAE to prevent ESRD is limited. Only in the past year was a study that evaluated the cost-effectiveness of screening for UAE in the general population published. In this analysis, patients with increased UAE were treated with an ACE inhibitor. The authors demonstrated that this approach was cost-effective to prevent cardiovascular events (68). Although evidence is accruing to indicate that individuals with hypertension and increased cardiovascular risk should be screened for UAE, more studies are needed to confirm that systematic screening is cost-effective in the general population. Epidemiologic and clinical evidence has established a pathophysiologic link between microalbuminuria and CVD in patients with diabetes and hypertension and in the general population. This correlation is observed even at levels of albuminuria below the conventional threshold for microalbuminuria (10). Screening for UAE can help clinicians estimate a patient's CVD risk and, if positive, should prompt the early introduction of a multifactorial intervention strategy that aim to improve the overall CVD risk factor profile as well as prevent further loss of renal function. Editorial assistance for the development of this manuscript was provided by Elaine Griffin with the financial support of the Bristol-Myers Squibb Sanofi-Synthelabo Partnership and the expert secretarial efforts of Margaret Wright.